english name "Arkansas Slender Caesar"
2. Amanita arkansana with Sherry Kaye (MOMA), ? ?, Missouri, U.S.A. 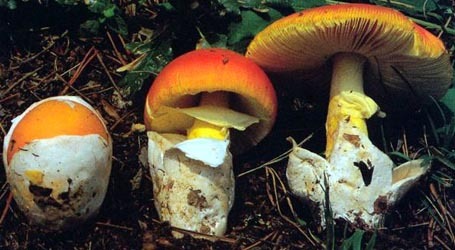 The orange-brown to brownish yellow cap of A. arkansana measures up to 150 or more mm wide and has a strongly striate margin. 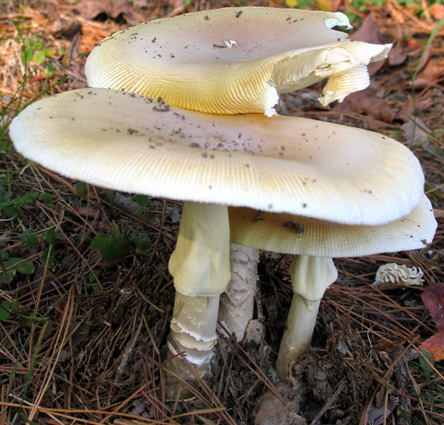 The gills are free (sometimes with a decurrent line, close to crowded, and fade from pale yellow to creamy white and (eventually) white as the mushroom ages. Its stem is up to 175 × 30 mm or larger and is pallid, with pale yellow remains of a felted extension of the internal volval limb distributed below the white annulus. This latter stipe decoration becomes a deeper yellow or orange from handling. A white, membranous, saccate volva encloses the stipe base. odor/taste The odor is absent or faint to mild or somewhat sweetish. 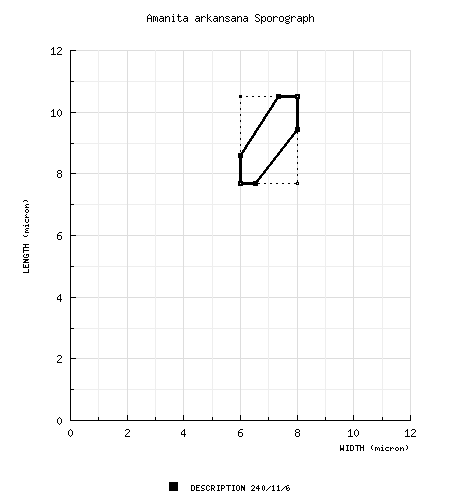 The spores measure (7.0-) 7.7 - 11.4 (-15.0) × (5.6-) 6.0 - 8.0 (-10.2) µm and are broadly ellipsoid to ellipsoid (rarely subglobose or cylindric) and inamyloid. Clamps are present at bases of basidia. 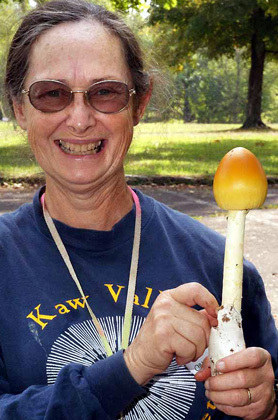 discussion Amanita arkansana is easily distinguished from Amanita jacksonii Pomerl. by its white lamellae, pallid stipe, and orange-brown pileus. Also, A. arkansana often forms larger and very fragile fruiting bodies. Amanita garabitoana Tulloss, Halling & G. M. Muell. is a Central American species related to A. arkansana. A Mexican species with narrower spores and yellower cap than A. garabitoana has recently been named A. hayalyuy Arora & Shepard. Amanita banningiana Tulloss nom. prov. is a smaller species, with a cap at first bright yellow, becoming orange-brown from the center outward through development; its stem is yellow with subfelted yellow fragments of the part of the volva originally present between the ring and the stem''s surface in the developing "button." The reader may also wish to check A. cahokiana. author H. R. Rosen. 1926. Mycologia 18: 97, pl. 9-11.
etymology Arkansas + -ana, suffix indicating possession; hence, "of Arkansas"
MK277510 nrLSU 24.vi.2000 David P. Lewis 6321 (RET 354-9) F. Nagy, Agaricales Diversification, Szeged Univ. type studies double click in markup mode to edit. selected illustrations Justice, J. 1984. Arkansas Naturalist 2(5): cover, 2. The following material not directly from the protolog of the present taxon is based upon molecular studies of Santiago Sanchez-Ramírez and a type study and orther original research of R. E. Tulloss. pileus 75 - 150+ mm wide, Orange-Buff (8.5YR 7.2/9.0) or Baryta Yellow (5Y 8.4/6.0) or 10YR 6/10 or deep orange or brownish red or brownish yellow (e.g., approximately 6B-D7-8 or 8C8) over disc, pale yellow to Lemon Yellow or yellow or orange-yellow (e.g., 4A5 or 4A8) or Light Cadmium yellow (2.5Y 7.5/10) near margin, never red or orange-red, sometimes virgate in central region, fading extensively in direct sunlight, otherwise unchanging when cut or bruised, subovoid at first, then hemispheric to rounded conic (sometimes with broad umbo), becoming convex to planoconvex to concave and (eventually) distinctly umbonate, subshiny, tacky or barely viscid, becoming dry; context white to pale yellow (1A2) except near pileipellis and near lamellae (in these regions always more intensely yellow than elsewhere), unchanging when cut or bruised, 4 - 9.5 mm thick, thinning evenly for one third to one half radius, then membranous to margin; margin conspicuously striate (0.4 - 0.5R), nonappendiculate; universal veil usually absent, rarely as one or two large white membranous patches. lamellae free or adnexed by decurrent line short or extending 10 - 20 mm down stipe apex, sometimes with decurrent tooth, close to crowded, yellow to cream in mass, in side view yellow at first (especially near edge and near context), then fading to very pale yellow (1A2) and then to creamy white or off white to white, unchanging when cut or bruised, 5 - 15 mm broad, with broadest point nearer pileus margin than stipe, sometimes with fimbriate and yellow or yellowish edge; lamellulae rounded truncate to subtruncate to subattenuate, apparently not frequent. stipe 100 - 174 × 12.5 - 30 mm, whitish to pale yellow (e.g., 3A3) to yellow, often more intensely colored above partial veil, narrowing upward slightly, flaring very slightly at apex, finely longitudinally striatulate, usually with irregular patches or fibrils in upper half, with patches and fibrils concolorous at first and becoming deeper yellow (e.g., 4A3-4) to tan to orange when handled; context white to cream or pale yellow nearest exterior surface fading to nearly white adjacent to central cylinder, unchanging when cut or bruised, with larva tunnels concolorous, stuffed with white cottony material, becoming hollow, with central cylinder 7 - 15± mm wide; partial veil subapical to superior (e.g., attached 19± mm below apex), membranous, yellow (e.g., 3A3), often more intensely colored on underside, large (up to 40 mm long), pendent, persistent, collapsing, sometimes tearing, with striate upper surface, with underside bearing patches and fibrils similar to those decorating stipe; universal veil as ample saccate volva, soft-leathery (like kid leather), grayish white to white on the exterior , with inner surface often pale yellow (orangish brown and sometimes peeling or flaking off rather easily in some exsiccata), membranous, rather thick (1.5 - 10 mm at mid-height of limb), rounded below, 30 - 60 (-110) × 32± - 80 mm, only attached near very base of stipe in mature specimens, with limbus internus small,white to pale yellow-orange, thin to rather thick, attached less than one third of way from stipe base to top of limb. odor/taste Odor absent or faint to mild or somewhat sweetish. Taste not recorded. tests Spot test for laccase (syringaldazine) - negative throughout basidiome. Spot test for tyrosinase (L-tyrosine) - scattered positive reactions—strong on surface of volva and spots in stipe base context after 3 - 4 min., strong reaction throughout volva after 9± min., faint in very limited region(s) on upper stipe context or surface after 8 - 20 min., faint on limited region(s) of pileus after 18 - 40 min. Test vouchers: Tulloss 10-26-85-A, Tulloss 7-16-87-C.
pileipellis (70-) 95 - 250 µm thick, with colorless and largely gelatinized suprapellis scant or up to 45 µm thick, with pale yellowish to yellow to orangish yellow to orange-yellow subpellis (70-) 95 - 230 µm thick, mostly ungelatinized; filamentous, undifferentiated hyphae 2.0 - 7.7 µm wide, in fascicles or singly, interwoven over disc, subradially arranged and more densely packed elsewhere; vascular hyphae 2.8 - 16.1 µm wide, occasionally branching, sinuous, scattered to locally common. pileus context filamentous, undifferentiated hyphae 2.2 - 11.2 µm wide, branching, plentiful, in broad fascicles and singly, interwoven in moderately open lattice, occasionally with yellowish subrefractive walls; acrophysalides plentiful, thin-walled, ovate to clavate to narrowly clavate to subfusiform, sometimes subrostrate or rostrate, up to 200+ × 56 µm; vascular hyphae 10.5 - 21 µm wide, scattered, sinuous. lamella trama bilateral, badly collapsed and only poorly rehydrating in isotype; wcs = 35 - 65 µm; subhymenial base of curved elongated cells, singly or in short chains, most or all intercalary, up to 56 × 21 µm, overlapping both subhymenium and central stratum, with admixture of occasional filamentous, undifferentiated hyphae; filamentous, undifferentiated hyphae 2.2 - 3.5 µm wide, with partially inflated intercalary segments up to 16.5 µm wide in central stratum; terminal, divergent inflated cells not observed; vascular hyphae not observed. subhymenium collapsed in type material, with parameters not accurately measurable (wst-near probably > 75 µm; wst-far probably ≤ 85 µm) in isotype; from recent collections (wst-near = 75 - 110 µm; wst-far = 95 - 125 µm); mixture of inflated cells and partially inflated or uninflated short hyphal segments, pseudoparenchymatous in some regions, with one to three cells between subhymenial base and nearest bases of basidia/-oles, with basidia arising from cells of all types. basidia In isotype: mostly collapsed, (up to 55± × 12.2- - 13.5+ µm). In non-type material: 39 - 57 × 9.0 - 13.8 µm, thin-walled, dominantly 4-, but also 3-, 2-, and 1-sterigmate, with sterigmata up to 6.5 × 3.0 µm (commonly quite slender); clamps occasional to rather common (especially in region of lamella with no mature basidia), prominent. universal veil On pileus: absent. On stipe base, exterior surface: sometimes partially gelatinized, with interior visible through plentiful gaps; filamentous, undifferentiated hyphae 1.5 - 8.5 µm wide, branching, dominant, singly and in narrow and broad fascicles, interwoven loosely, without dominant orientation, with some partially to strongly gelatinized, sometimes making loose coil, occasionally with yellowish subrefractive walls; vascular hyphae not observed. On stipe base, interior: mostly colorless or pale yellowish, but with brownish orange zone parallel to and a little below the exterior surface (occupying region between 5% and 10% of distance from outer surface to inner surface in well-preserved limb fragment, with similar region seen in other mounts of older limbs not very well rehydratable), with outermost 30±% of thickness rehydrating most poorly; filamentous, undifferentiated hyphae 1.5 - 9.8 µm wide, branching, plentiful to locally dominant, in fascicles and singly, often coiling, interwoven in loose lattice, occasionally with yellowish subrefractive and slightly thickened walls; inflated cells plentiful to locally dominant (apparently in clusters) especially in region away from exterior surface, terminal, with walls thin or up to 0.5 µm thick, subglobose to pyriform to broadly ovoid to broadly ellipsoid (up to 85 × 65 µm) and ellipsoid to clavate to narrowly clavate (up to 78 × 46 µm); vascular hyphae not observed; clamps common. On stipe base, inner surface: elements like those of interior collapsed and strongly gelatinized in layer 10 - 35 µm thick, colorless to golden yellow (in isotype). stipe context longitudinally acrophysalidic; filamentous, undifferentiated hyphae 3.8 - 11.9 µm wide, branching, plentiful to dominant (near surface), in fascicles and singly; acrophysalides dominant away from surface, thin-walled, often broad and rounded at base, up to 145 × 48 µm; vascular hyphae 2.8 - 21 µm wide, scattered, sinuous, infrequently coiled or twisted. partial veil gelatinized somewhat on surfaces; filamentous, undifferentiated hyphae 1.5 - 7.4 µm wide, branching, dominating, singly and in fascicles, with numerous fascicles coparallel and subradial (with interweaving single hyphae and fascicles between them), closely packed, occasionally with yellowish subrefractive walls; inflated cells terminal, subfusiform to narrowly clavate to clavate to ellipsoid (up to 109 × 39 µm), thin-walled, relatively common; vascular hyphae 3.8 - 16.1 µm wide, sinuous, occasionally loosely tangled locally, scattered to locally rather common. composite of data from all material revised by RET & CRC: [240/11/6] (7.0-) 7.7 - 10.5 (-15.0) × (5.6-) 6.0 - 8.0 (-10.2) µm, (L = (8.0-) 8.3 - 9.9 µm; L’ = 8.9 µm; W = (6.3-) 6.5 -7.3 µm; W’ = 6.9 µm; Q = (1.10-) 1.18 - 1.43 (-1.69); Q = (1.22-) 1.24 - 1.38; Q’ = 1.30), hyaline, colorless, smooth, thin-walled, inamyloid, broadly ellipsoid to ellipsoid, rarely subglobose, rarely elongate, often at least somewhat adaxially flattened, rarely as "giant spores"; apiculus sublateral, cylindric to narrowly truncate-conic, usually relatively small, sometimes proportionately broad; contents granular to mono- or occasionally multiguttulate with additional small granules; white in deposit. ecology Solitary to scattered or (occasionally) in troops. Arkansas: In frondose woods or in mixed woods (probably near Quercus). Florida: In coarse sand under Pinus clausa. Mississippi: In damp, sandy loam of river bottom, in forest of Quercus nigra, Q. phellos, and P. echinata with Nyssa sylvatica, Ilex sp., Carpinus caroliniana, and Liquidambar styraciflua. Texas: In mixed Pinus-hardwood forest. material examined U.S.A.: ARKANSAS—Pulaski Co. - Little Rock, Arkansas Dept. of Pollution Control & Ecology, 14.vi.1994 Jay Justice s.n. (RET 136-6); unkn. loc., 5.vii.1983 J. Justice s.n. [Tulloss 7-5-83-JJ2] (RET 059-3). Saline Co. - 25 mi W of Little Rock, 5.vi.1981 J. Justice s.n. [Tulloss 6-5-81-JJ1] (RET 059-4). Washington[?] Co. - E of Fayetteville, E of Mt. Sequoia, 13.x.1925 [packet marked "13.x.1926" (sic)] H. R. Rosen s.n. (holotype, BPI; isotypes TENN 21294 & 21299). FLORIDA—Alachua Co. - Gainesville, across from Fla. St. Mus., 11.viii.1985 A. Norarevian s.n. [Tulloss 8-11-85-AN1] (RET 137-5). Leon Co. - Tallahassee, Hawkins prop., 14.vii.2007 J. B. Hawkins s.n. [RET 7-14-07-A] (RET 408-7). GEORGIA— Gwinnett Co. - Berkeley Lake [33.9829° N/ 84.1823° W, 300m], 24.vi.2013 J. Craine s.n. (RET 543-8). INDIANA—Montgomery Co. - Waveland, Shades St. Pk. [39.9378° N/ 87.0894° W, 223 m], 28.viii.2012 Stephen Russell s.n. [mushroomobserver.org #107627] (RET 532-4). MISSISSIPPI—Jackson Co. - Pascagoula R. Wildlife Mgmt. Area, 16.vii.1987 D. C. & R. E. Tulloss 7-16-87-C (in herb. David T. Jenkins, Univ. Ala., Birmingham; RET 149-5). TEXAS—Hardin or Tyler Co. - Big Thicket Nat. Preserve, Turkey Crk. Unit, 26.x.1985 A. Norarevian & J. Justice s.n. [Tulloss 10-26-85-A] (RET 139-10, nrITS & nrLSU & tef1 & rpb2 seq'd.). Newton Co. - 1.6 km N of Bleakwood, off St. Hwy. 87, 11.vii.2000 David P. Lewis 6333 (RET 354-6), 24.vi.2000 David P. Lewis 6321 (RET 354-9, nrITS & nrLSU & tef1 & rpb2 seq'd. ); Bleakwood, Lewis prop., 24.ix.2000 David P. Lewis 6358 (RET 354-10). Tyler Co. - 8 km E of Spurger, Forest Lake Exp. For., off rd. FM1013, ca. plots 39 & 41, 26.vi.1994 D. P. Lewis 5302 (RET 283-5, nrITS & nrLSU & tef1 & rpb2 seq'd.). discussion Rosen had the opportunity to compare A. arkansana with a red-capped species (possibly A. jacksonii) in the field and found that the two taxa were never intermixed and that the colors of the pilei of the two taxa were constant from "button" to mature basidiome and that no intergrading of colors was to be found. He also notes that the volval sac is larger in A. arkansana than in the red-capped species and that the lamellae of A. arkansana becoming distinctly whiter than those of the red-capped species in mature basidiomes. The isotype in BPI is composed of two specimens reduced to fragments: One specimen is mature, but very poorly dried or dried in senescence; the other is immature. The date on the BPI isotype packet results from an apparent slip of the pen. A handwritten label in the packet identifies the material as "ex type" and bears the year "1926"; however, the protolog clearly states that the holotype collection was made on 13 October 1925. The isotype in TENN comprises several stipe bases and a few pileal fragments. Annotation indicates that this is duplicate material extracted from the BPI isotype. Rosen was a member of the faculty of the Department of Plant Pathology, University of Arkansas, Fayetteville. Therefore, an effort was made to find the holotype of A. arkansana in both UARK and the herbarium of the Plant Pathology Department. The holotype was not to be found in either institution, and apparently it is lost. Therefore, a lectotype should be designated. Because of the more thorough and abundant representation of all parts of the basidiomes, I plan to designate the isotype in BPI as the lectotype of this species (ICBN §7.4). It is also noteworthy the material at BPI is the material that was reviewed by Gilbert (1941). Dr. Jay Justice, Mr. David Lewis, and Mr. Aaron Norarevian have kindly given me several recent collections of A. arkansana from which additional data on this species has been extracted. 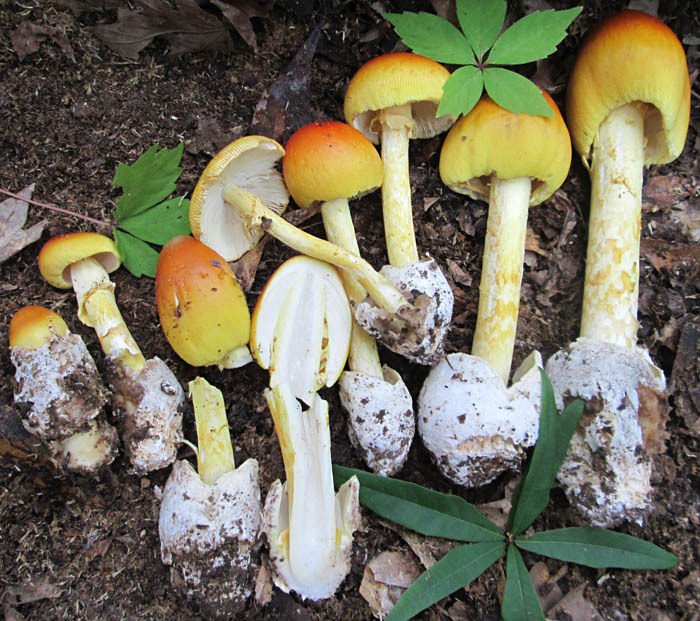 This species is assignable to Amanita stirps Hemibapha and can be distinguished from other taxa within that stirpes by key here [PDF]. The specimen with the largest value of Q was a specimen with rather common giant spores occurring on 1- and 2-sterigmate basidia. John Rapp - (2) unknown locality, Missouri, U.S.A.
Jimmy Caine - (5) Berkeley Lake, Gwinnett County, Georgia, U.S.A. (RET 543-8) [Note: Original image can be found on www.mushroomobserver.org observation #137525.
select a collection to review/add spore measurements..#702042. J. Justice, #AR-AM-7, U.S.A., ARKANSAS, Unkn. Co., Lake Sylvia Recreati..#702050. A. Norarevian & J. Justice, #s.n.=>Tulloss 10-26-85-A, U.S.A., TEXAS, H..#702051. David P. Lewis, #6333, U.S.A., TEXAS, Newton Co., 1.6 km N of Bleakwood..#702052. David P. Lewis, #6321, U.S.A., TEXAS, Newton Co., 1.6 km N of Bleakwood..#702054. D. P. Lewis, #5302, U.S.A., TEXAS, Tyler Co., 8 km E of Spurger, Fores..#766679. Jay Justice, #s.n., U.S.A., ARKANSAS, Pulaski Co., Little Rock, Arkansa..#766680. J. Justice, #s.n.=>Tulloss 7-5-83-JJ2, U.S.A., ARKANSAS, Pulaski Co., u..#766681. J. Justice, #s.n.=>Tulloss 6-5-81-JJ1, U.S.A., ARKANSAS, Saline Co., 25..#766682. H. R. Rosen, #s.n.=>packet marked "13.x.1926" (sic), U.S.A., ARKANSAS, ..#766683. J. Justice, #AR-AM-7, U.S.A., ARKANSAS, Unkn. Co., Lake Sylvia Recreati..#766684. A. Norarevian, #s.n.=>Tulloss 8-11-85-AN1, U.S.A., FLORIDA, Alachua Co...#766685. J. B. Hawkins, #s.n.=>RET 7-14-07-A, U.S.A., FLORIDA, Leon Co., Tallaha..#766742. A. Norarevian & J. Justice, #s.n.=>Tulloss 10-26-85-A, U.S.A., TEXAS, H..#766743. David P. Lewis, #6333, U.S.A., TEXAS, Newton Co., 1.6 km N of Bleakwood..#766744. David P. Lewis, #6321, U.S.A., TEXAS, Newton Co., 1.6 km N of Bleakwood..#766745. David P. Lewis, #6358, U.S.A., TEXAS, Newton Co., Bleakwood, Lewis prop..#766746. D. P. Lewis, #5302, U.S.A., TEXAS, Tyler Co., 8 km E of Spurger, Fores..#766836. J. Justice AR-AM-7 , #s.n., U.S.A., ARKANSAS, Unkn. Co., Lake Sylvia ..#767288. Stephen Russell, #s.n.=>mushroomobserver.org # 107627#767289. Stephen Russell, #s.n=>mushroomobserver.org # 107643#767290. Patrick Harvey, #s.n.=>mushroomobserver.org # 110771#767347. J. Justice, #s.n., U.S.A., MISSOURI, Stoddard Co., Mingo National Wildl..#767360. #ENDFONT., U.S.A., INDIANA, .#767376. #., U.S.A., MISSISSIPPI, .#772000. J. Craine, #s.n., U.S.A., GEORGIA, Gwinnett Co., Berkeley Lake#772001. Stephen Russell s.n., #s.n.=>mushroomobserver.org # 107627#787402. Jay Justice s.n. , #s.n., U.S.A., ARKANSAS, Pulaski Co., Little Rock, ..#787403. J. Justice, #s.n.=>Tulloss 7-5-83-JJ2, U.S.A., ARKANSAS, Pulaski Co., u..#787404. J. Justice s.n. , #s.n.=>Tulloss 6-5-81-JJ1, U.S.A., ARKANSAS, Saline ..#787405. H. R. Rosen, #s.n.=>packet marked "13.x.1926" (sic), U.S.A., ARKANSAS,..#787406. A. Norarevian, #s.n.=>Tulloss 8-11-85-AN1, U.S.A., FLORIDA, Alachua Co..#787407. J. B. Hawkins, #s.n.=>RET 7-14-07-A, U.S.A., FLORIDA, Leon Co., Talla..#787408. J. Craine, #s.n., U.S.A., GEORGIA, Gwinnett Co., Berkeley Lake#787409. Stephen Russell s.n., #s.n.=>mushroomobserver.org # 107627#787410. D. C. & R. E. Tulloss, #7-16-87-C, U.S.A., MISSISSIPPI, Jackson Co., Pa..#787411. A. Norarevian & J. Justice, #s.n.=>Tulloss 10-26-85-A, U.S.A., TEXAS,..#787412. David P. Lewis, #6333, U.S.A., TEXAS, Newton Co., 1.6 km N of Bleakwoo..#787413. David P. Lewis, #6358, U.S.A., TEXAS, Newton Co., Bleakwood, Lewis pro..#787414. D. P. Lewis, #5302, U.S.A., TEXAS, Tyler County - 8 km E of Spurger, ..